TULSA, Okla.--(BUSINESS WIRE)-- Williams (NYS: WMB) today lost a transformative founder and former leader of the company when John H. Williams died at his home in Linville, N.C. He was 94. Mr. Williams worked for the original Williams Brothers as early as 1938. Along with his brother Charlie and cousin David, he was part of the "second generation" of Williams family members who bought the company from founders Dave and Miller Williams in 1949. He served as president and CEO from 1949 to 1971; chairman and CEO from 1971 to 1979; board member from 1949 to 1993; and honorary board member from 1994 until his death. "This is a huge loss to many of us personally and certainly for our great company," said Williams' president and chief executive officer, Alan Armstrong. "John's combination of wisdom and courage was extraordinary. He has been an inspiration to all who have been lucky enough to know him." One of Mr. Williams' signature achievements was Williams' 1966 purchase of Great Lakes Pipe Line, at the time a substantially larger company than Williams. The acquisition set Williams on the path to becoming a major operator of energy infrastructure. The unlikely deal was characterized by Barron's as a "minnow swallowing a whale." Under Mr. Williams' leadership, the company grew rapidly and enjoyed unprecedented success. During his 29-year tenure as CEO, the company's market value increased from $25,000 in 1949 to $406.5 million in 1978. From 1964 to 1974, Williams' average combined return to investors ranked No. 1 among Fortune 500 companies. 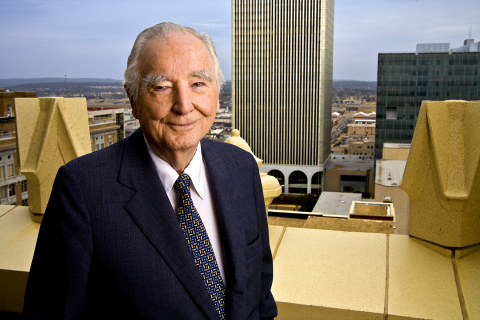 Mr. Williams also was a driving force in the redevelopment of downtown Tulsa. The 52-story BOK Tower and adjacent Williams Center Forum (now the Williams Resource Center) are direct results of his vision for the Williams headquarters city. He graduated from Ruston Academy in Havana, Cuba and Yale University, where he majored in civil engineering. After joining the family business, he worked on projects in North and South America and the Middle East, in addition to serving in the Navy Civil Engineering Corps during World War II. Mr. Williams has earned many accolades for professional and community leadership, including an award from the Bolivian government for his company's work in that country and the Governor's Arts Award for his role in establishing Tulsa's Performing Arts Center. He is survived by his spouse, Joanne S. Williams, and three sons: John H. Williams, Jr. and his spouse, Carol, of Tulsa; Burch I. Williams and spouse, Gay, of Tulsa; and S. Miller Williams and spouse, Constance, of Asheville, N.C.
Williams is one of the leading energy infrastructure companies in North America. It owns interests in or operates 15,000 miles of interstate gas pipelines, 1,000 miles of NGL transportation pipelines, and more than 10,000 miles of oil and gas gathering pipelines. The company's facilities have daily gas processing capacity of 6.6 billion cubic feet of natural gas and NGL production of more than 200,000 barrels per day. Williams owns approximately 68 percent of Williams Partners L.P. (NYS: WPZ) , one of the largest diversified energy master limited partnerships. Williams Partners owns most of Williams' interstate gas pipeline and domestic midstream assets. The company's headquarters is in Tulsa, Okla. For more information, visit www.williams.com, where the company routinely posts important information. Portions of this document may constitute "forward-looking statements" as defined by federal law. Although the company believes any such statements are based on reasonable assumptions, there is no assurance that actual outcomes will not be materially different. Any such statements are made in reliance on the "safe harbor" protections provided under the Private Securities Reform Act of 1995. Additional information about issues that could lead to material changes in performance is contained in the company's annual reports filed with the Securities and Exchange Commission. The article Former Williams CEO John H. Williams Dies at 94 originally appeared on Fool.com.